First, an announcement: I’m pregnant again! I’ve shared about baby chicks, baby goats and now a brand new (human) baby bird is coming. Next, a proclamation: I hate feeling nauseous and throwing up! The good news is that I learned a lot of natural morning sickness remedies (and a few not so natural) my first go around. I had it pretty bad and now consider myself a bit of an expert. The next day after my positive home pregnancy test, I jumped on Amazon and ordered a few provisions. Not a fan of being sick, either? Here is a list of all of the remedies I have tried and found helpful. They are roughly in order from more natural to more intensive. Please remember that I am not a physician and you should always consult your own midwife, doctor, or care provider regarding your own particular health. Preggie Pop Drops. These are little sour candies. The company also makes lollipops, but I find them too big. The drops can really help you get to the place where you are ready to eat something else. They are also good to have stashed in your purse, diaper bag and desk at work. Psi Bands!!! These are bracelets that push on a pressure point on your inner wrist that directly reduces nausea. Crazy, but they really work to take the edge off. On bad days, I wore them nearly the whole day and took them off to sleep. Sea Bands are a similar concept but look a little like an ace bandage. This may sound gross, but if you are for sure going to throw up, eat something that isn’t so bad coming up, like applesauce. My first pregnancy, I could guarantee vomiting at least once in the morning throughout weeks 8-16, and this helped it go a little easier. Ginger Candy. There’s ginger hard candy, ginger chews, ginger gum, and crystalized ginger. Spicy, but effective. Ginger Beer and Ginger Ale. Start by sipping just a little. Eat like a toddler. Really the secret is to keep food in your stomach. Frequent, small meals are the way to go. At the peak of morning sickness, I ate something every 30 minutes. This time around, I snack whenever I feed Little Bird a snack (usually the same thing), and it works out. Also, snacks and sweets are good to get you to the place you can eat, but the goal is to eat a mini balanced meal. Protein and complex carbohydrates are especially important in making you feel good again. Humor your cravings and aversions (as long as they aren’t totally unhealthy or unsafe.) Pregnancy likes/dislikes are fickle, but for the most part, go with them. Can’t get enough fresh watermelon? Great! My first pregnancy, after days of not wanting to eat anything, I found that I could eat fresh Vietnamese spring rolls. I then ate them four days in a row. Going for a walk outside. Yup, the last thing you probably want to do. But getting outside and getting the blood flowing can help. Other gentle exercise, like yoga, could help, too. I like to stay very active during pregnancy, typically with Bar Method, but first trimester is definitely a time to find balance with gentle, easy exercise. Coca-cola. I know, not very natural. But my mother is from the South and gave us a little bit of coke when we were sick and it strangely can settle the stomach. (Like the ginger beer or ginger ale, start by sipping a little, a whole can would probably make me feel worse from all the sugar.) If you are worried about GMO corn syrup, try a Mexican market. The coke sold in bottles is usually made with cane sugar. You can also buy the mini cans instead of 12oz ones. Vitamin B-6 was recommended by my doctor. I personally didn’t find it super helpful. A fried of mine found good results with a shot of B-6, which is usually a much larger dose. Soothing teas. I personally didn’t find tea appetizing, but others find pregnancy teas soothing. A Facebook friend suggested drinking it iced. I found making my Red Raspberry Leaf tea iced for the third trimester vastly improved the taste. Here is a recipe. This next section are remedies that you may want to tell your doctor/midwife you are using, just to be sure that they aren’t contraindicated in your particular case. Along with acupuncture, Chinese Herbs have been used for millennia. It has always seemed strange to me that western medicine says to avoid herbs of any kind during pregnancy, while still prescribing heavy pharmaceuticals. Their answer: there hasn’t been enough studies to prove the safety of herbs. Well, turns out there is plenty of peer-reviewed evidence published. It’s just in Chinese!! I have been amazed by the benefit I’ve received from herbs given to me in conjunction with acupuncture. Many of the ingredients are not that scary: ginger, licorice, orange peel, cinnamon, date… (I tend to be a rule follower and dutifully informed my doctor of everything I am taking. At first the doctors got into a tizzy that licorice could raise my blood pressure, but since mine remains 100/50, they have grudgingly approved of the tincture.) If you want to consult with someone, Eti is available by phone for those outside of San Diego. My friend Ahlea also consults locally and by phone on pre- and postnatal nutrition and herbs. Two over the counter medications that I did not try, but that my doctor recommended are Benadryl and Unisom (especially in combination with B-6). I didn’t try them out, but it might be worth discussing a trial of one or both with your doctor before trying a prescription. And if all that fails and you are interested in talking to your doctor about a prescription, here are my thoughts on a few medications I have tried. Remember, I am not a doctor, just offering my own personal reviews. Phenergan (Promethazine) is also prescribed for Hyperemesis gravidarum. It is an antihistamine and is very sedating. Its use is NOT recommended during breastfeeding. I did not like it at all. Even a quarter of a pill knocked me out completely in a “drugged” kind of way. I can’t imagine anyone being able to use it while caring for a toddler. But everyone reacts differently! So there you go! More than enough ideas to at least start with. 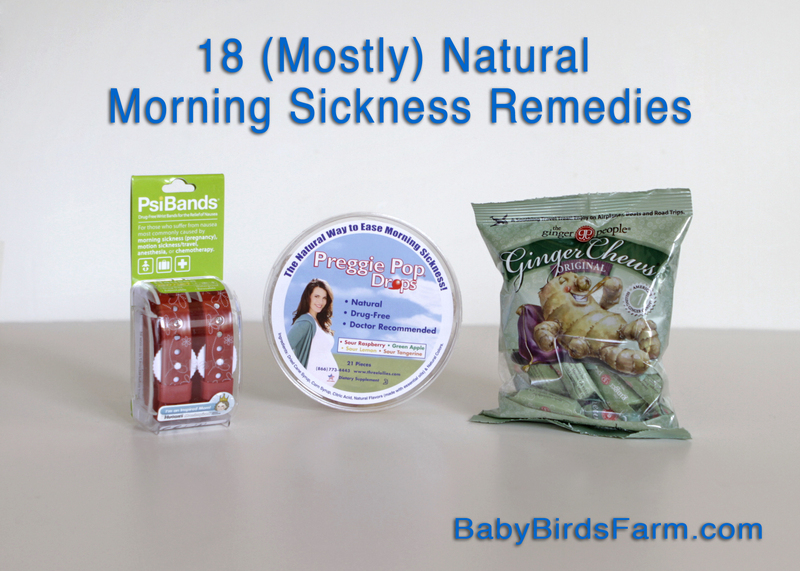 Enter a giveaway of a prize pack with my favorite remedies here! What worked for you? please comment and share morning sickness remedies that you recommend or would like to try. Disclaimer: I am an Amazon Affiliate, meaning qualifying purchases made through links in this post, any post, and in our Store, are fulfilled by Amazon and may result in a small percentage as a referral fee being paid to Baby Birds Farm. Your price will never go up because of that, in fact, you will automatically get the lowest price Amazon offers. Purchasers are strictly anonymous, and we are never informed of who makes purchases or what they buy. If you do buy something I’ve featured, or even just do your general shopping of anything on Amazon, we appreciate your support!